It's a very exciting time at the Oaks Club. 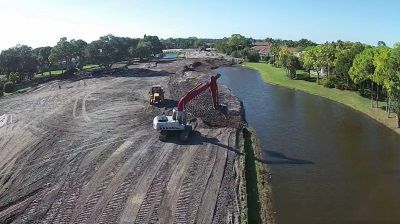 It's one of the most popular golf club and residential communities in the Sarasota area and soon it will be even better. In September of this year, ground was broken on the renovation of Heron, one of the two top-notch courses at the club. The work is being carried out by Jason Straka of Fry/Straka Global Golf Course Design and the 15-month project sounds like it will yield some spectacular results. One of the main objectives of the renovation is to allow the course to appeal to a broader spectrum of golfers. The enhanced playability and improved infrastructure aim to make the course accessible for everyone from beginners to seasoned pros and six new tees are being added. The new course will be 6705 yards in length, the front tees at 4027. The renovation will be comprehensive including new drainage, greens, bunkers and irrigation, as well as new cart paths and enhancements to the bridges. The project aims to be environmentally friendly, with soil and water conservation being of prime importance. According to Nick Kearns, Greens and Grounds Director, "the old soil from the greens will be reused to build new tees and the concrete from the existing cart paths will be crushed and reused for the new paths." Esthetic considerations also factor into the new design, with certain less bucolic vistas now to be hidden—like the view of the practice range currently visible form the 18th hole. With all this renovation going on, it doesn't mean that there is no golfing at the Oaks Club, because the Club's second course, Eagle, will be open throughout the renovation. The Eagle course was designed by Arthur Hills and has yardage ranging from 4426 to 7003. In addition, the club has state-of-the-art practice facilities and a pro shop, as well as an activity program including juniors, lessons and clinics and the club championship. If you're looking for a home in a Sarasota Golf Community, but aren't sure which would be the best option for you, get in touch with Team Coffey & Co. today on 877.308.6311. We'll be happy to make recommendations and arrange showings.